The combination of Mohammad Rafi, Laxmikant Pyarellal and Dharmender stormed bollywood films of 1960s and 1970s. When LP emerged in the musical arena with Parasmani and Dosti, bollywood music was being dominated by Shankar Jaikishan, Naushad Ali, Roshanlal Nagrath, OP Nayyar, Madanmohan Kohli and other big composers who created history. The stars of the golden age were associated with the big composers, for example Raj Kapoor was associated with Shankar Jaikishan, Dilip Kumar with Naushad Ali, to name a few. So Laxmikant Pyarellal required an upcoming star with whom they could create partnership. Dharmender was one of those stars. Mohammad Rafi sang the maximum number of songs in the career of Dharmender. The majority of them were composed by Laxmikant Pyarellal. In Aye Din Bahar Ke in 1966, all the songs of Mohammad Rafi in the film became smash hits including “khudaya khair”, “mere dushman”, etc. In 1969, Dharmender’s film Aya Sawan Jhoom Ke had hits after hits of Mohammad Rafi including “aya sawan jhoom ke”, “majhi chal”, “bura mat suno”, “yeh shama to jali”, etc. Rafi, LP and Dharmender created storm with the film Mere Humdum Mere Dost in 1968. All the songs were melodious and romantic including “na ja kahin ab na ja”, “hui sham unka khayal”, “chalkaye jam”, etc. Dharmender’s film Izzat in 1968 also had the great compositions of LP. Rafi and Lata’s duet song “yeh dil tum bin kahin lagta nahin hum kya Karen” had ghazal andaz. In the film Jeevan Mrityu released in 1970, Rafi’s song “jhilmil sitaron ka” became a big hit. In the 1970s, the magic combination continued. In the Dharmender film Man Ki Ankhen, all the songs of Rafi including “jala diya”, “dil kahen ruk ja re ruk ja” created storm in bollywood. In Dharmender’s film Loafer in 1973, Rafi’s song “aaj mausam bara beimaan hai” became very popular. Anand Bakshi wrote majority of songs of LP and Rafi combination. In the film Mera Gaon Mera Desh, duet song of Rafi and Lata “kuch keheta yeh sawan” became big hit. In 1975, Rafi’s song “mai jat yaamla pagla deewana” became a cult song. LP Rafi and Dharmender created magic again. In Dharamveer in 1977, LP’s song sung by Rafi titled “o meri mehbooba” and “are maine tujhko chaha” became successful. Jeetender appeared with Dharmender in the film. Very significantly Rafi song “tu meri aas paas hai” became successful in the 1980s. Rafi sang the last song in his life in Aas Paas under the composition of Laxmikant Pyarellal. One article is too little to mention the performance of LP and Dharmender combination. LP even composed music in other films like Satyakam, Sharafat, etc. In the major compositions of LP the love for Mohammad Rafi was reflected always. Rafi could almost imitate the voice presence of Dharmender in his songs. The films and the songs of Dharmender Rafi and LP combination should be publicized and preserved. This entry was posted on Friday, October 26th, 2012 at 6:58 pm	and is filed under Meri Awaaz Suno. You can follow any responses to this entry through the RSS 2.0 feed. You can leave a response, or trackback from your own site. Thanks Binuje, I did not see this page since January 2013. Have seen it today. And will get in touch with you. Thanks to Souvikji too. Laxmikand – Payerelal did continue with Md Rafi even in the 1970s, when the chips were down for the great singer, and almost divided their songs for KK and Md Rafi for different heroes, but they did not stuck to Md Rafi alone, like they did in their early days in the 60s, when the rose to the ladder of fame, and Md Rafi was their main singer. It ‘s really from the heart – must say. Will be pleased to interact with you. I would like to make a point on Jae-Bee’s heat-touching reaction. Let’s not be too emotional to envisage that, had Shammi continued as a hero in the 70s, he might renounce Md Rafi.Shammi’s latter comments on his idol singer speaks for itself. But let’s not forget that, great musicians like Roshan and Jaikishan passed away in 60s and 70s, we missed MM since mid 70s, Ravi & Naushadji were left with no assignment at that time and at the same time and KA, who were not consistent in terms of using Md Rafi since late 60s, completely sided with kishore since the RD wave. But I wonder, what about the producers and directors of the 50 and 60s, who rose to tremendous fortune with Md Rafi in those days finally succumbed to the desires of the heroes and music directors totally ? How could it be possible? Moreover, I believe, they might not be as conversant with music as they were aware of making good masala movies in Mumbai. However, during RD’s era, I believe, quality of songs declined in terms of nuances and depth if compared with songs composed in the 1960s. However, I feel if opinions of all music experts of these days are gathered together, I have no doubt that majority of them would prefer the depth and range of Md Rafi to KIshore or any other male singer till date. But no such expert opinion poll is conducted these days ( I am not unaware of the Out Look song polls ), if that is made, it would provide better insights to music lovers to realize the sublime elements of great singer like Md Rafi sahab. Even though Rafi’s last song sung was for Dharmendra’s film, @Aas Paas. There were many films after where Rafi had songs released. Such as Baghawat (which had Mere Mehboob Tujhe Salaam & Nagin Sa Roop Hai Tera). There was also Teesri Aankh (Kya Jalwa Kya Nazara, Eid Ke Din Gale Mil, and my favourite one from this Salaam Salaam Main Aa Gaya). Even Ther film Daavedar which was later renamed to Mera Karam Mera Dharam had a good Rafi song, Apne Dil Mein Josh Hai. Gone are the the days of melodious music and such melodious singers also. I listen to new tracks however end up going back to the classics, especially by Laxmikant Pyarelal. post-26 Nairjee, good luck for what? and there is no contest over here, just simple observations. 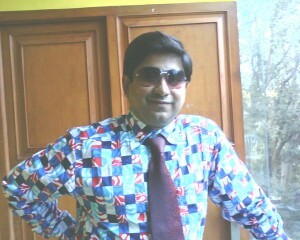 fyi not only I am a die-hard rafian i am a fan of sj, lp, opn, sdb, rdb and all the great mds of golden era. not only that the great shammi is my idol. but the fact remains that shammijee remembered his friend from sachhai and rbd from teesri manzil but forgot rafi sahab during manoranjan. and not only lp but i would use the same yard stick for naushad in saathi. the only big time md that stood to his ground was madan mohanjee and to some extend ravi and sonik-omi, usha khanna also stayed with rafi sahab, but both of them never got big banners. the only actor that stayed with rafi sahab was raaj kumar, but he didn’t get many movies in mid 70’s. so the bottom line is, this is not filmy duniya it is filmoney duniya. when money talks, friends walk. Ironically kishoreda knew this very well. good luck – to your views. No Contest. Jay-Bee. Just wish to Say You Are Wide Off the Mark as far as SJ is concerned. By the same yard stick LAXMIKANT-PYARELAL used Mukesh for movies like Milan & Dharti Kare Pukar Ke. What does it Mean to you? Meantime, I expect SJ fans to reply to your point of view. Post No.24, Binu Nairjee, it is possible to be shanker-jaikishen. In dharamjee’s earlier career it was mukesh, hemant etc., but after rafi sahab was established by md’s and dharamjee himself. it was sj and opn who gave songs to mahendra and kk for dharam. Most people don’t realize that it was sj who paved the road of sucess for kk than the burmans. For rajesh the super hit from Andaz. Giving all the songs to kk for new comer a Kapoor (randhir) swithing to kk from rafi in movie for Biswajeet as well as Mehmood. I bet if Shammi’s career had prolonged a couple of more years they would have had kk singing for him too, they tried a background song on shammi by kk in one of shammi’s last movies as a hero. To me it is wrong to blame bengalis in general when earlier rafi bhakts shyed away from him during kk’s peak years. Dharmendra reaches for a Song Picturisation. He hears the song. Then, refuses to Shoot. Well , the music composer for a change ‘was’ Not R.D.Burman or S.D.Burman . Neither Kalyanji Anandji. Thanks for the beautiful reply. Yes Rafisahab sang the song “john jani janardan” which was picturised on Amitabh Bacchan in the film Naseeb. But yes, Dharmender, Shammi Kapoor, Raj Kapoor and many legendary stars came in that song and it was a great gesture of Manmohan Desai to bring the stars together. Thanks for the comments once again. my humble choice is rafi saab-dharamji combinaton. to close my eyes and i feel the action of dharamji. saab while seeing the scene. indeed it’s good artical and informative. Thanks for the comments. In the late 1960s, Laxmikant Pyarellal had to face the musical giants Shankar Jaikishan, OP Nayyar, Roshanlal Nagrath, so his combination with Rafi and Dharmender did not get the publicity they required. But good music was created in the films Mere Hum Mere Dost, Aye Din Bahar Ke, Aya Sawan Jhumke. But by 1970s, every music lover started identifying Laxmikant Pyarellal as strong composer and the combination of Rafi Dharmender and LP flourished. All the songs in the 1970s became super hit in films like Loafer, Izzat, Jeevan Mrityu, Pratigya, etc. The list can go on. Laxmikant Pyarellal composed the maximum number of songs for Dharmender, Jeetender and Rishi Kapoor. In all their films Mohammad Rafi contributed the most. God made one earth and one voice and that is only Mohd Rafi………. kk has sung it well but if Rafisaab had sung it, it would be something out of the world, Kk’s voice is too coarse for a delicate song like this Like you said, it does not matter. Rafisaab has sung so many great songs that can never be matched ever by anyone. Post 16. RD Burman also made kk sing for Biswajit, Joy Mukerjee and SD Burman went a step too far in asking kk to sing for Dilip Kumar. Every effort was made to side line Rafisaab but it all failed. r.d. burman and s. d. burman did try to plant Kishore’s voice on sanjeev kumar, shashi kapoor and dharmendra but it was always going to be a futile exercise as Kishore kumar could rarely ‘modulate’ his voice for the stars. The experiment more or less failed since sdb’s health was failing fast and r.d.b after a thunderous assault – going swiftly ‘downhill’ during the seventies. That left lot of room for laxmikant-pyarelal and their favourite singer mohammad rafi to bring in ‘new’ tunes and musical style with the able help of good lyrics from anand bakshi. this trio dominated the late seventies and even rishi kapoor after wavering for some time found it better to take the services of mohd rafi saaheb who had earlier sung for his grandfather, father and uncles. a nice write-up and good photograph of your s on the cover. keep writing dear and we are always there to add our comments. I listened to the song from deedar e yaar .I was hearing it after a long long time.I would say kk has sung it well,but the romance, the innocence and mainly the muslim atmosphere (culture , the feel) is missing surely,It sounds like a song picturised not in a traditional muslim family.Rafi saab surely would have taken it to new height.I wonder why lp chose kishore .Just listen only to the audio and u will never realise the situation correctly.Anyway bygone is bygone no one can change it.LP were great , and so was rafi saab. Thanks a lot for giving an extensive list of Rafi Roshan combination. I had written 2 article on Rafi and Roshanlal Nagrath. One was dedicated to Pradeep Kumar as most of Roshanlal Nagrath’s successful songs were in his films. Each of your songs were masterpieces. Rafi’s songs in those films had remained immortal. Post 6. Salim you are right, sarakti made a ordinary song which you wouldn’t listen a second time. Thanks for uploading the Akhri Dao beauties. Aisana ho has been not listened for long time and listening it now is breeze. Thanks for refreshing my memories. Janab Vinod Sahab, here is Rafi and Roshan’s combo. If I miss any movie and song, please forgive me. Jo baat tujh me hai , teri tasveer me nahin – Taj Mahal, who will forget the melodies of this movie, particularly the famous duet of Rafi and Lata. Log kahte hain ke tumse kinara karlen with beautiful lyrics by Saahir – Bahu Begum. In the same movie another hit number, penned by Saahir, Ham intezar karenge qyamat tak. Mile na phool to kanton se dosti karli, beautifully written by Kaifi Aazmi – Anokhi Raat. In 1977, Rafi Sahab sang for Roshan’s son Rajesh Roshan in the movie, Inkaar, in 1978 Swarg Narak, Aag hai llagi hui, then in 1980 for Dev Anand’s movie Manpasand, Daaton kavale datun ( Last of Rafi Sahab for Dev Anand ), then in 1980 again two songs for Unees Bees, then in 1981 two songs for the movie Shaaqa, then in 1981, for the movie Yaarana, picturized on Amjad Khan and lastly in 1984 for the movie Yaadon ki Zanjeer, picturized on Sunil Dutt. Nice article Mr. Souvik. Its very true that Rafi Sahab sang all the songs very nicely for all the actors . Rafi Sahab was Gem. But the harmony of Rafi Sahab + Dharmendra + Laxmi Pyare is really fantastic. You mentioned most of the songs of these stars in your list but there are two another songs I would like to highlight is from film “Baghawat”. There were 2 songs of Rafi Sahab in this movie & picturised on Dharmendra & music was composed by Laxmikant Pyarelal. One was solo song of Rafi Sahab — “Nagin Sa Roop Hai Tera Main Banke Prem Sapera……..” and other was Rafi Sahab’s duet with Asha Bhonsle — “Mere Mehboob Tujhe Salam…” Both songs were melodious & superb. 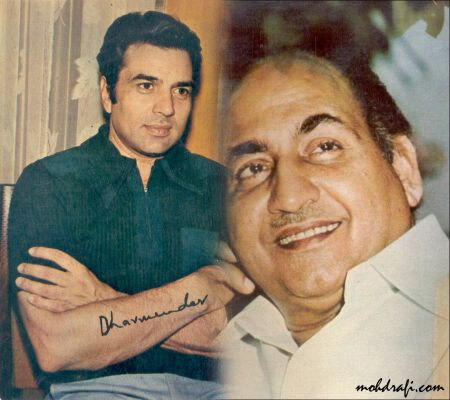 But very well done Mr. Souvik, I like your article & Rafi Sahab & Dharmendra’s photo also. Laxi Pyare would not get the status they have without the incredible Rafisaab. I however told Pyare bhai that i will never forgive them for not asking Rafisaab to sing :sarakti jaye hai rookh se naqab” from deedar e-yaar, with all due respects, kishore did not do justice to that song, i dont think any singer could beautify the song that Rafisaab could. There is a film AAkhri dao made in 75 where Rafisaab sang 2 solos. These songs if sung by an other singer would be forgotten on day 1 but the magic of Rafisaab’s singing has made these songs and all his songs as immortal. These 2 songs i have heard more than a thousand times. All great LP songs are sung by Rafisaab and the music duo always appreciate this fact. Well done souvik bhai for taking the time out to write this. Happy eid and dussehra to everyone. In reply to Manishji’s post, yes Madanmohanji composed music in many brilliant films of Dharmender including Aap Ki Parchayiya, Neela Akash, Anpadh, Haqeekat, Dulhan Ek Raat Ki, etc. For that matter Shankar Jaikishan composed impressive music in Dharmender’s successful films like Shikar, Pyar Hi Pyar, Yakeen, etc. where Mohammad Rafi created gems. Many of these composers died subsequently. Roshanji died in 1967, Jaikishanji died in 1971, Madanmohansahab died in 1975. LP sustained for a longer period and composed music in more than 510 films. As Dharmender also ruled bollywood films for more than 30 years, so Rafi, LP and Dharmender combination had really created history. Our rafi sahab is always given his performance in a such manner and we always find that his voice is always matching with any artist and we feel that artist himself rendering the song. rafi sahab apni awaaz ko is tarah banate hai ki lagta hai ki woh kalakaar khud hi gaa raha hai chahe woh dharam ji ho yaa fir om prakash ji , haan jaisa ki aapne bataya hai ki rafi sahab ki awaaz dhram ji bhi ko bhi achhi lagti hai . thanks for your article , one request is there if you give me some information and write up for the combination of rafi sahab and roshan ji. Really Rafi Saheb was the ‘ANMOL RATNA’ of Golden Era of our film industry, his melodious songs were actually helped our yesteryear heroes like, Dilip Kumar, Raj Kumar, Rajendra Kumar, Sanjeev Kumar, Jeetendra, Dharmendra, Rishi Kappor, especially Shammi Kapoor etc. to get their films a big hit as well as their fame. After the death of Rafi Saheb, a number of singers appeared in the film industry and released thousands of songs, but even today a major portion of real music lovers like the songs of Golden Era of our film industry especially the melodious songs of Legend singer Mohd Rafi Saheb. I am sure that my beloved Rafi Saheb and his songs will remain in the heart of Music Lovers for ever. true, lp-dharmendra-rafi were like naushad-dilip-rafi..but before lp became popular, it was mostly madanmohan-dharmendra-rafi in movies like haqeeqat, aapki parchhaiyaan, neela akash, dulhan ek raat ki etc..opn also worked in mohabbat zindagi hai and bahaaren phir bhi aayengi.